The WWE Royal Rumble is one of my most favorite wrestling pay per views that I love watching every year. Since it's usually shown on a Sunday night in the U.S., that translates to a Monday morning in my timezone. Since the show is live during my worktime, I'll have to watch it when I get home which would most likely be a solid 8 hours after it's ended. I do try my best to avoid any spoilers so I can watch the show with the suspense of not knowing what's gonna happen. Social media though makes it extremely difficult with all the live tweets, fan discussion, viewer reactions, memes and news updates readily available online. I had to avoid looking at my phone, which had trending topics automatically loaded on my landing page. I had to disable automatic notifications in case it pops up on my screen. I had to lessen reading my friends' social media feeds in case they were sharing anything about the event. All this led me to staying offline as much as possible. In case you don't know what my job is, I manage social media. So much for staying offline. 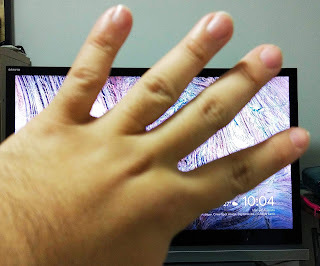 So my best effort was whenever I hinted a page would show results, updates or any news about the Royal Rumble, I would cover the screen with my hand or cover part of my eyes, similar to the technique I use when watching horror movie. I kinda survived the day. I finally got home. I didn't mention it during dinner in case my family would accidentally talk about it much more tell me who won. I took the risk of not saying I would watch that night so it wouldn't be a dinner topic. Dinner was over and I was ready to watch. I found out that the show is 5 hours long. I don't have 5 hours to spare! So I settled for watching an hour and a half of it and decided to watch the rest the next day. The next day was more challenging as there's even more content online: more tweets, more video clips, more screenshots, more and more of everything. The trend hasn't died down yet. Even the website with the on demand video already posted the results. I just had to be very careful avoiding any news possible. Because of this, I had to sacrifice my usual engagements with my online communities, a couple of wrestling fan friends and just treated it as if it never happened. I survived the day again and finally got home and was ready to watch. I turned on the TV, loaded the on-demand video sit back and relaxed. Looks like I relaxed too much. I woke up with the main match already halfway through and not following the action from the start led me to confusion on what happened, why did it happen, who was on while I was asleep and how much did I miss! I eventually had to restart the video but lost precious watching time, especially since it' been over 48 hours since it aired. I did get to finish it but my sleepiness got the better of me. All this because I wanted to watch it without finding out any spoilers. So what did I do the next day? I just read a summary of the show online. What do I plan to do for the next live event? If I could take the day off and watch, I would. But more realistically, I'll probably go through this entire experience again. How do you manage spoilers?